Greetings, and Happy Halloween!!! I hope you like my costume today!!! This week we will “weigh-in” on the situation with the use of hand weights, and bearing our own body weight!!! We will incorporate some spooky asanas for Halloween, as well!!! Our mudra focus is “USHAS”, or connecting to all things good, and our Sanskrit focus is Sattva, the Guna of luminosity, purity, harmony, lightness, and balance. It is “to be”, in a light, balanced state. 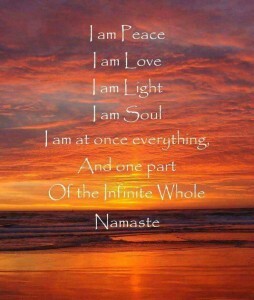 Practicing yoga helps us achieve this beautiful state of being!!! Our music for meditation comes from Ann Sweeten’s “Echoes of the Sun”. The meditation focus is “Just Breathe”!!! Deb has a new Meditation I session beginning tomorrow evening from 7:30-8:30 p.m, and you may register through noon tomorrow. The cost is $70. Kim will be offering a Mommy and Me yoga practice the second Monday of each month, from 11 a.m.-Noon.It begins this month on 11/14. The cost is $10, and we ask that you pre-register and pre-pay. It is a time to bond, practice, and meet new moms, and babies. Ages 1-4 years. Watch for the newsletter!!! It will be available on your email desk tomorrow morning at 10 a.m.!!! This entry was posted in Uncategorized on October 31, 2016 by Deb Potts. 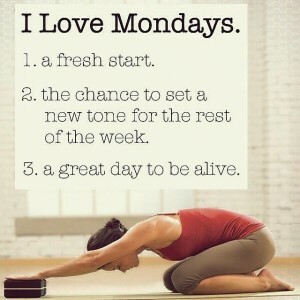 Classic Hatha Week with a Kick!!! Greetings from YFL!!! What a wonderful celebratory week we had at YFL. My thanks to all that participated, especially our staff and guest teachers-Sophie, Kim, Ansley, and Monica!!! The biggest thanks to ALL of our supporting students!!! We look forward to moving ahead to many more years of sharing the practice of yoga with you at YFL!!! DHANYA VAD!!! This is Classic Hatha week on the mat, as you attend class with Deb. The practice will emphasize movement and flow in a very meditative way. It is strong and elegant all wrapped into one experience. Our meditation music is The Dove from Classical New Age Piano. The meditation focus is “Light”. Our Sanskrit focus is “JNANA”, or The Yoga of Wisdom and Knowledge. Our mudra will support this focus, as we take the classic “JNANA” mudra to evoke the energy of Universal Wisdom. We greet Kim this week, as she will be hosting a special event at YFL, on Wednesday evening (10/26), from 7-8 p.m. She will be guiding a Reiki Healing Circle Group. Reiki is an ancient modality of harnessing the healing energy from the Universal Source into our bodies without touch. Kim will guide the use of this energy from Source to you as an individual, and in the way that you need the support of this energy for your well-being. This is a “By Donation” event at YFL. Deb’s next 5-week Meditation I class will begin on Tuesday, November 1st, from 7:30-8:30 p.m. The cost is $70, and we are currently registering. Please call, email, or drop-in to register. This entry was posted in Uncategorized on October 24, 2016 by Deb Potts. Greetings Yogis and Yoginis!!! Wow, wow, wow!!! What a wonderful 10th anniversary celebration we had yesterday!!! We had a packed house for Yin/Meditation, Reiki, and Yogapuncture!!! The festivities continue throughout the week with daily door prize drawings at Deb’s classes, bring a friend and you both practice FREE, a special Ayurvedic Yoga class with Sophie on Saturday at 12:30-cost is $12, and a Finale’ event with Deb on Sunday @ 5 p.m., a FREE Drum Circle practice!!! I have said it many times, and will repeat it one more time, DHANYA VAD—expressing extreme gratitude and thanks for everyone’s support of the teachings at YFL!!! YOU made these ten years possible, and so much FUN!!! Cheers to many more years!!! This week’s practice is Yoga at the Wall. We take our warrior spirit to its surface for resistance yoga. It is deep and challenging, but any level can do this practice!!! Our Sanskrit focus is DHANYA VAD, or living with a sense of deep gratitude. Our Mudra focus (hand gesture) is the SHAAKINI, or “SMILE” MUDRA!!! It opens the throat chakra, activates the thyroid gland for balanced metabolism, and releases tension in the jaws and throat. It promotes a head and heart connection for decision making. Our meditation focus is “Gratitude” set to Debussy’s Claire de Lune. Sophie’s new four week session of Ayurvedic Transformation begins today @ 12:30, and there is still time to register. The cost is $99. Deb’s next 5-week Meditation I will begin on Tuesday, November 1st. Come try Joyce’s Classic Hatha, offered every Tu/Th from 10-11:15 a.m., all Levels welcome!!! Kim will be offering a healing Reiki workshop on Wednesday, October 26th, from 7-8 p.m., and it is by donation. So many wonderful offerings to experience at YFL!!! This entry was posted in Uncategorized on October 17, 2016 by Deb Potts. This week our physical practice will focus upon restoration!!! We will be incorporating the use of props, and deep, replenishing pranayama. Our Sanskrit focus is Moksa, which means “to release”, or letting go of whatever is holding you back. The mudra for this week is “Garuda”, or the “freedom” hand gesture. Garuda is the mystical bird that personifies freedom, strength, and power. Above the clouds, freedom knows no bounds. The meditation music is from Bhakti Hreem, “Devotion”, and the “dhyana”, or meditation focus for this second week of October, is “To Shed”, or let go of what we no longer need. Our 10th anniversary celebration begins this Sunday, 10/16!!! Join Deb at 9:30 for a free Yin and Meditation class, Kim at 11:30 for a Reiki workshop (donation based), and Ansley and Monica for Yogapuncture at 3 p.m. (pre-registration and payment required, $40). All week, Deb will host door prize drawings in her classes!!! Sophie will host an Ayurvedic Yoga class on 10/22, from Noon-1:30, and the cost is $12. Deb will conclude the week long celebration on Sunday, 10/23, from 5-6 p.m. with a FREE Drum Circle event. All week you may bring a “newbie” to class, and you will both practice for FREE!!! Come join the celebration!!! We could not have reached this business milestone without YOUR SUPPORT!!! DHANYA VAD!!! This entry was posted in Uncategorized on October 10, 2016 by Deb Potts.